Namayingo Women Artisans and Children continue to extract gold with the aid of Mercury despite countless risks and international ban. Two (2) people have so far lost their lives in the Deadly Pits after being covered by soil in pits between 80 – 100 feets. In the mines filled with heaps of soil as several men, women and children are busy filtering it with mercury. Nakudi gold mining site in Bujwanga parish, Banda sub-county is littered with open pits, dag close to the lake shores which pauses a question on the safety of water and the people around the area. Despite the depth of the pits which measure up to 80-100-feet deep, the residents have no protective gear where hundreds of residents, including children and women, are found in open pits searching for gold. In Namayingo an area with gold prospects populated by artisanal , speculators and traditional citizens , A story of Gold mining is told differently with many re-counting benefits and others still mourning having failed to benefit. At Banda sub-County in Nakudi village Bujwanga Parish where gold Mining originated in Namayingo, I meet 48 year old Auma Doreen a female artisan who came from Nakasongola District to benefit from Gold business. 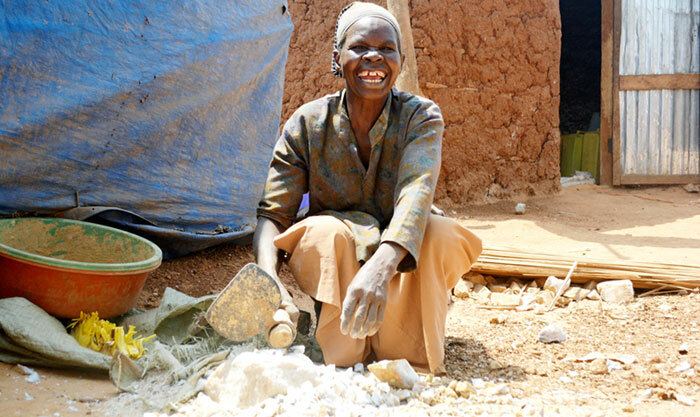 Worried about severe back pain and Mercury threat as she was told by Authorities, Auma can’t do without Mining given limited alternatives to generate a living for her family. “Sometimes in the night I’m troubled with chest pains! The back as well, I cough due to dust. I hurt but we need money. When I get capital I will then create a decent job for myself” she says. Auma explains that Gold mining business in Namayingo is stained with highs and lows especially on the side of women artisans and those with low expertise and capital. Her 2 years of quest for Gold has seen her buy land where she is planning to build a house and she has also managed to pay school fees for her two Boys. With her palms chock-full of dead-like skin, Auma wakes up every day to crash rocks with a hoe and hummer looking for Gold. 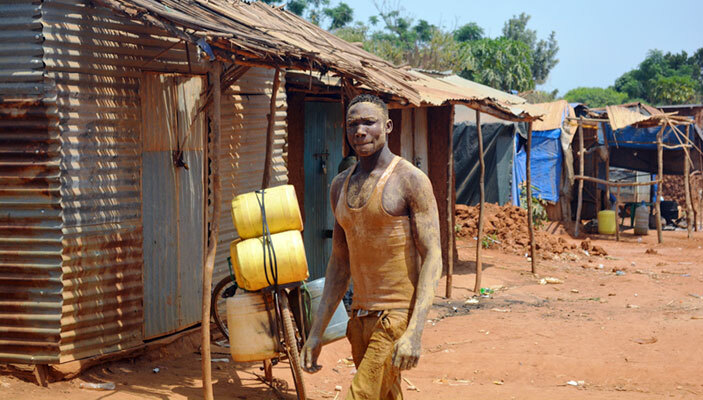 In the mining site full of children below age of consent, youths and women, 16 Year old Denis Alaka a Primary Six Pupil visits the Mines every weekend to clean the ore in quest for Gold flakes. The 16 year old Alaka explains that he is paid 2000 Ugx for every basin of crashed mud and the money is sometimes doubled in case he collects a gram of gold flakes. Alaka explains that he uses mercury which is provided by pit owners and other miners who assign him work. Without any protective gear, Alaka has been involved in the mining business since the age of 15. Osiko Charles a land lord and a stake holder in the budding Nakudi small scale mining association that seek to harmonise mining in the area says that children are not allowed in the mines during school times but during weekends they are left to try their luck since most of them work with their parents. Zayinah Asaani a Female Artisan and a member of Nakudi small scale mining association explains that allowing child miners has encouraged school drop outs and aided the worrying academic performance of Schools around the area. Joseph Osinya explains that parents are to blame for child miners as many have been sensitized but many have insisted explaining that they guide them. Osinya who doubles as a miner and the mining site Chairman explains that the Artisans association is encouraging miners to use Borax instead of Mercury even though some are still smuggling it into the mines. 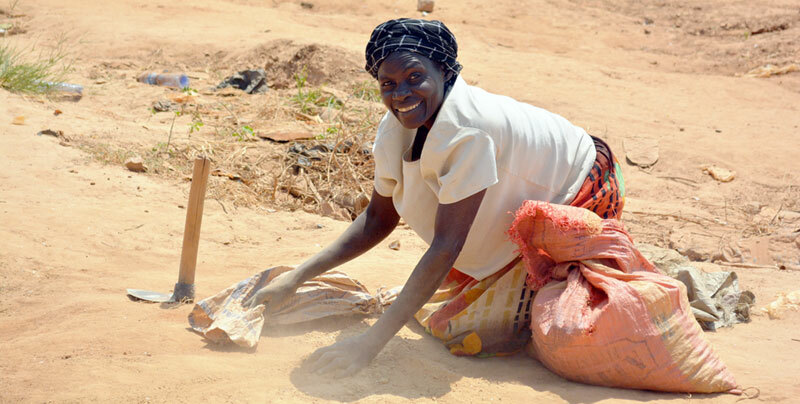 The story of Gold mining in Namayingo begun at a burial ceremony in the home of Mzee Pascal Tanga when one of the Mourners who were allegedly a geologist from Kampala told the grave diggers the soil dug from the grave had special Minerals. They closed it and dug another one, several kilometres away but they discovered traces of the precious mineral there too. “Some people who came to dig the grave were gold miners from Tiira gold mining area in Sikuda, Busia District. Osinya explains that in Nakudi, at least two (2) people have so far lost their lives in the Deadly Pits after being covered by soil in pits between 80 – 100 feets. However, unconfirmed reports indicate that about 5 people have died in Namayingo Gold pits. In Namayingo Gold rocks are dug are extracted from underground and then crushed into powder using stone crashers , metallic mortar before it is taken to a cleaning point where either mercury or Borax is used to s filtered using a crude methods in basins and cans. It is a netted tray where the powder is put and water poured. As the soil sinks, gold particles remain on top. The miners then use mercury or Borax to attract gold that sinks through with the soil. On the 10/10/2013, Uganda assented to the Minamata Convention on Mercury an international treaty designed to protect human health and the environment from anthropogenic emissions and releases of mercury and mercury compounds. Food Chemist Deborah Wendiro explains that Mercury is a toxic substance that attacks the central nervous system though there is no known safe level of exposure. She explains that Mercury has direct impact on food especially in the areas where Mercury is used and agriculture takes place as well. Mercury can also affect women’s reproductive health, for example by reducing fertility and increasing the chance of miscarriage. Artisanal miners are exposed to mercury through the inhalation of vapors that develop when the amalgam is smelted. While National Environment Management Regulations 1999 recognise the harmful effects of mercury and its associated compounds and provide guidelines for the handling as well as transportation of mercury. Uganda is home to significant gold deposits scattered across the country but its mining story is one that leaves a lot to be desired with the industry run by artisanal miners,speculators, smugglers andillegal miners. UK-based environmental NGO, Global Witnessinits 18 month long investigation in 2017 exposed endemic corruption and mismanagement in the country’s fledgling mining sector with crooked officials, and international investors are profiting at the expense of Uganda’s people, environment and economy. Gold was first reported in West Nile in 1915, but commercial mining did not start until 1933. By 1965, only 148,043ounces were mined in Ankole, Kigezi and Bukedi sub-regions. Deposits have since been reported in Mubende, Busia, Namayingo and Karamoja areas. A recent study estimates that more than 400,000 people in Uganda are directly engaged in the activity, and an additional 1.5 million are benefitting indirectly. There are an estimated 10 to 15 million artisanal gold miners worldwide, working in about 70 countries. In some regions, up to 20 percent of miners are children. According to the International Labor Organization (ILO), there are about one million children working in artisanal mining worldwide, and the number is rising.